2017 Home Run Derby participants line up before Derby begins. 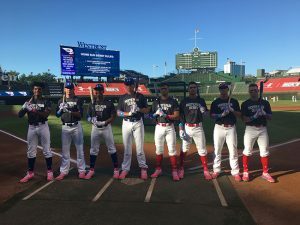 Before the Under Armour All-America Game, eight players participated in the B45 Home Run Derby. Each player got two minutes to hit as many home runs as they could. 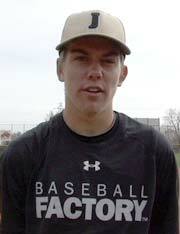 Four players were chosen from the National Team and four were chosen from the American Team. The player who hits the most home runs for each team will move onto the finals to compete for the crown.
.@NolanGorman dead central EZ for second HR after liner out to RCF to get on board. Off fence above RF bleachers and nearly onto Sheffield. Nolan Gorman and Elijah Cabell have a swing off after tie of 6 HR in order to meet Nander De Sedas in the finals, Gorman advances. The finals: Nander De Sedas vs. Nolan Gorman. Nolan Gorman wins. 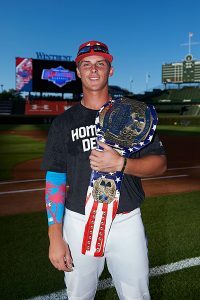 Gorman wins the HR Derby and sports the championship belt.